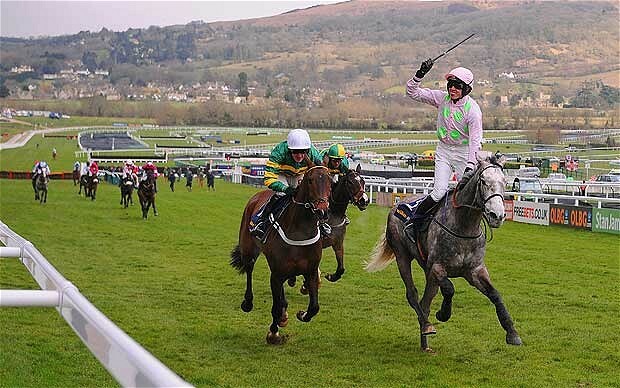 Irish champion trainer Willie Mullins set out his Festival stall early in 2013 with a treble on day one. Champagne Fever, the winner of the Weatherbys Champion Bumper in 2012, won the William Hill Supreme Novices’ Hurdle, Hurricane Fly regained his title in the Stan James Champion Hurdle, reversing 2012 form with Rock On Ruby, and the admirable mare Quevega won the OLBG Mares’ Hurdle for the fifth year running. All three were ridden by Ruby Walsh, but Mullins’ son, Patrick, joined the party early on day two, making up 6 lengths on the run-in to win the John Oaksey National Hunt Chase on Back In Focus, also saddled by his father. Mullins Snr. and Walsh added Briar Hill – unbelievably a 25/1 chance – in the Weatherbys Champion Bumper later in the day to their respective totals and that was enough for the pair to take the leading trainer and jockey titles. Elsewhere, Sprinter Sacre turned the Queen Mother Champion Chase into the anticipated procession, barely coming off the bridle to win by 19 lengths, Solwhit won the Ladbrokes World Hurdle and Bobs Worth won the Betfred Cheltenham Gold Cup. The hitherto unbeaten Our Conor, trained by Dessie Hughes and ridden by Brian Cooper, was the easiest winner of the JCB Triumph Hurdle for many a year, effortlessly drawing clear in the closing stages to win by 15 lengths. 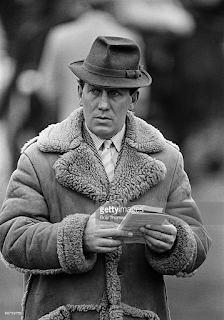 David Nicholson, universally known as “The Duke”, was a highly successful National Hunt trainer. In a 31-year career, he saddled a total of 1,499 winners, including 17 at the Cheltenham Festival, and won the National Hunt Trainers’ Championship twice, in 1993/94 and 1994/95. In fact, he was the only trainer to break the monopoly on the trainers’ title held by Martin Pipe between 1988/89 and 2004/05. Instantly recognisable on the racecourse by his gaudy sheepskin coat and red socks, and famous for his frank, forthright attitude, Nicholson sent out his first Cheltenham Festival winner in 1986. The victory of Solar Cloud in the Triumph Hurdle, though, was followed by another for Charter Party in the National Hunt Chase later the same day. Charter Party would return to Prestbury Park two years later to win the Cheltenham Gold Cup. Alongside property developer Colin Smith, who owned a share of Charter Party, Nicholson was instrumental in the development of Jackdaws Castle, a state-of-the-art training facility in Temple Guiting, near Cheltenham, now occupied by Jonjo O’Neill. As the horse racing tips indicate, this paid dividends. In 1990, he sold Cotswold House, in Condicote, near Stow-on-the-Wold and accepted a salaried position at Jackdaws Castle. Later Cheltenham Festival highlights included Mysilv in the Triumph Hurdle in 1994, Viking Flagship in the Queen Mother Champion Chase in 1994 and 1995 and Anzum in the Stayers’ Hurdle in 1999. David Nicholson retired from training in 1999 and died, from a heart attack, in 2006, at the age of 67. 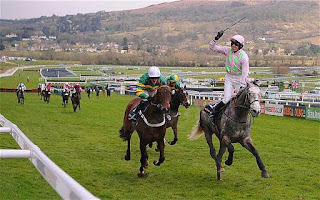 In 2008, a new race, registered as the David Nicholson Mares’ Hurdle, was added to the Cheltenham in his memory but, for sponsorship purposes, has been run as the OLBG Mares’ Hurdle since 2011.